All four us headed for a ferry today. Speed and a catamaran straight to Friedrichshafen was Mr CW’s chosen vessel whilst the boys and I snipped off a small arm of the lake and took a five minute car ferry over to Meersberg. 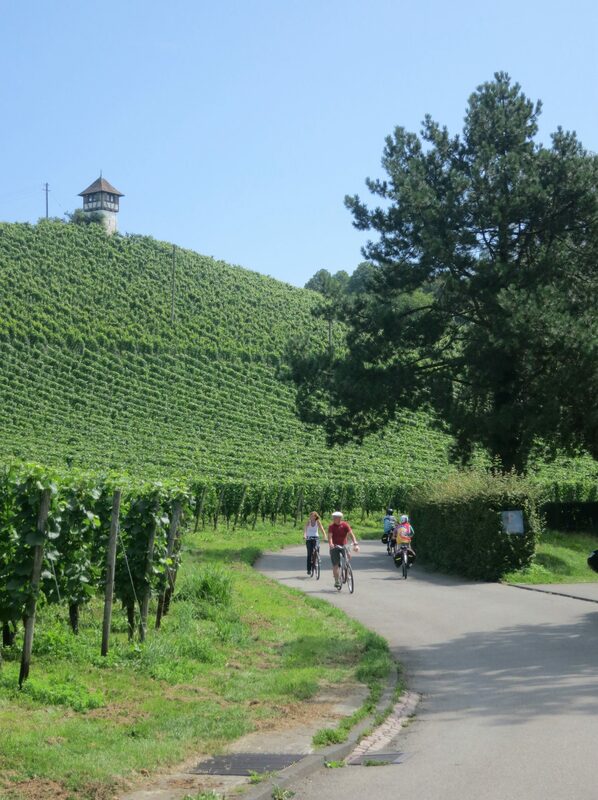 Once on the northern shore of the lake we cycled through vineyards toward Friedrichshafen. Graf Friedrich von Zeppelin set up his eponymous airship company in Friedrichshafen and modern versions buzz overhead filled with tourists on astronomically expensive day trips. Our budget doesn’t stretch to flights round the lake and so we made do with a visit to the excellent Zeppelin museum. If asked I would have said that airships were giant balloons with no infrastructure: wrong. In fact they have an incredibly complex metal substructure encased in the balloon coating. The famous LZ129 Hindenberg took five years to construct, a ticket for the two day flight to New York cost 1.200 Reichmarks, or half a year’s wages for one of the mechanics who helped make it. You wander through full sized reconstructions of the surprisingly spacious state rooms and peer into the cramped sleeping quarters. 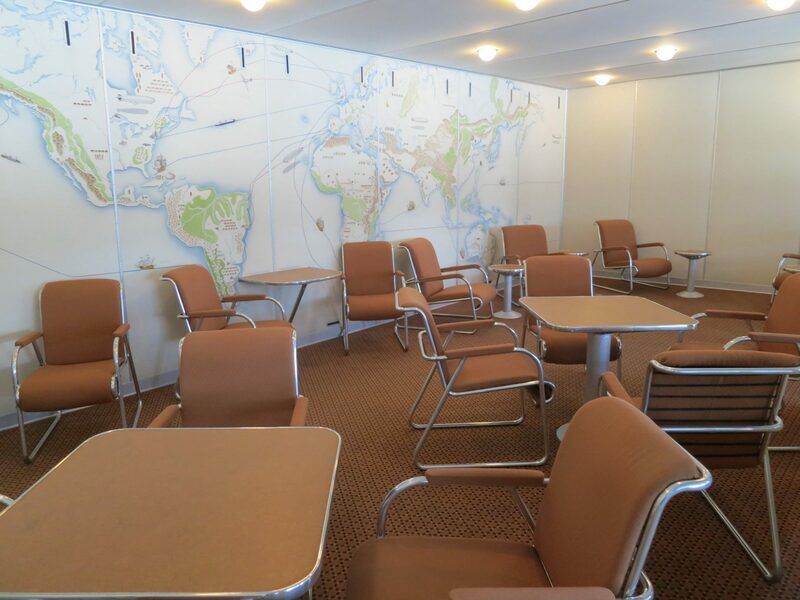 Flights started in May 1936 and had a successful first season with 72% occupancy. However on the first flight of the 1937 season as the airship came into land near New York it caught fire; 32 seconds later the airship was gone with a loss of 35 of the 97 people on board. The disaster marked the end of commercial airship flights. After we had learnt all about airships we strolled along the lake front and partook of the traditional coffee and cake. Whilst we sat down we saw lots of people messing around in boats, some drifted by in sailing boats and others zipped past in motor boats. 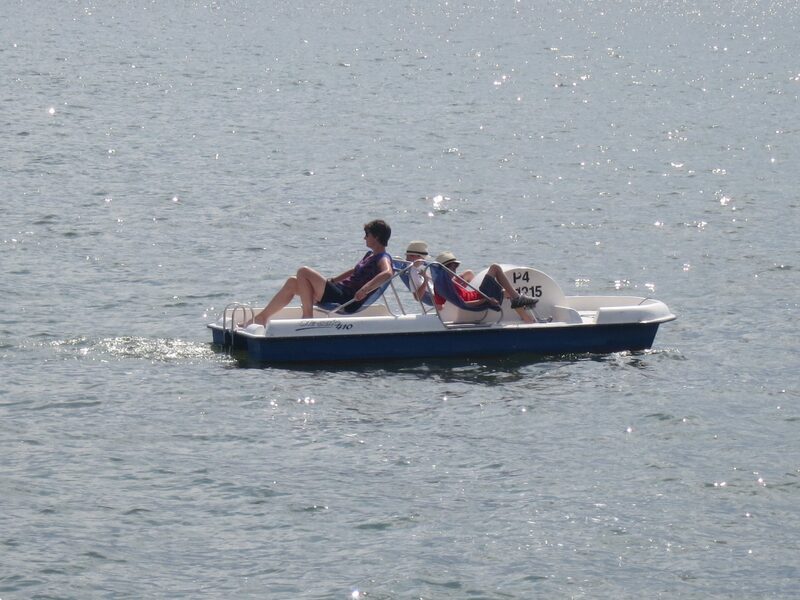 We decided to shell out €7 to join them in a pedalo. For half an hour the junior CW’s pedalled furiously whilst I took in the view. Way before Graf Zeppelin came to Friedrichshafen the Benedictine monks were here and they built a fine monastery. In 1802 the monks no longer found the place viable and handed over the buildings to the Kingdom of Württemberg. King Wilhelm I of Württemberg took a fancy to the place and had it converted into a summer palace and so it remains today. The Schlosskirche is the only part of the palace open to the public and is well worth a visit. 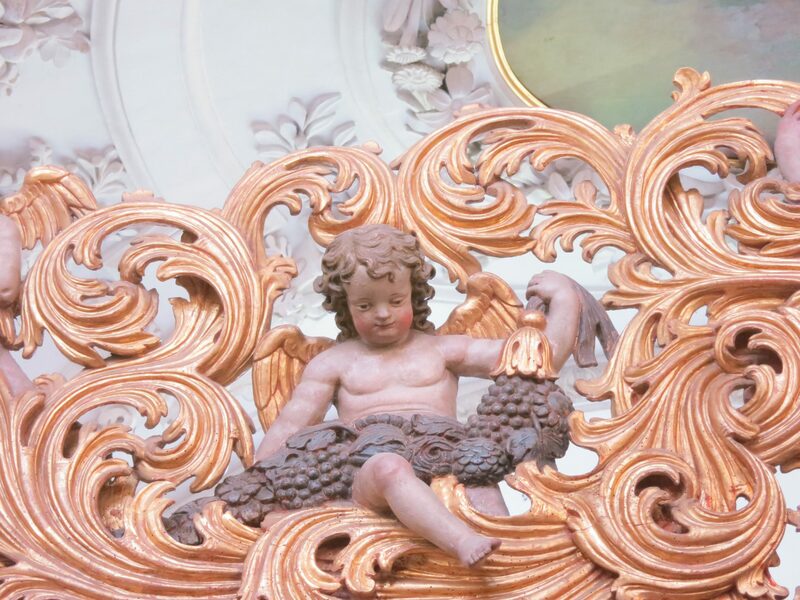 The interior froths with exuberant plasterwork and cherubs holding up some of the local grapes. Friedrichshafen has been a good place to spend a day, its lake-front promenade has provided cafés and beer gardens. Most importantly it had an exchange point for one of our bicycles that developed a worrying scraping noise having been hurled to the ground too eagerly at one ice cream stop. Everything went very smoothly. We have been wondering why we have previously gone through the hassle of strapping our bikes on the back of the car and transporting them across Europe, they almost inevitably come off the back of the car in a slightly more battered state that then has to be fixed. Just handing the bike over to someone else was so much more pleasant. My oldest son wrote his own post about our circumnavigation of Lake Constance click here to read a 10 year olds view.